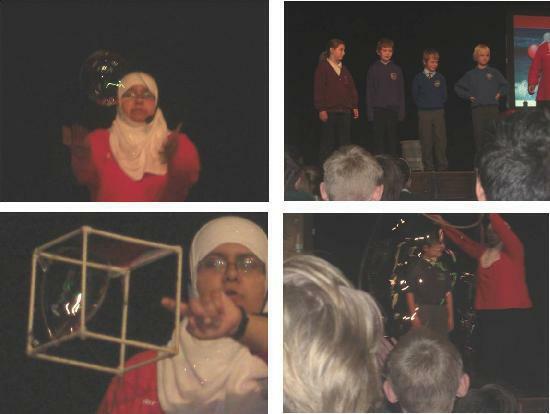 On the 27th September we all went to the Civic Hall to watch a show called “The bubble show”. When we got there lots of other schools had also arrived, I think we all saw a few people we knew. Then the show began, the woman blew some bubbles but they were very small so she got out a stick called the flower wand, this blew out lots of bubbles which were stuck together, it was great .Then she got out a bubble trumpet it blew out quite big bubbles, we had to try and keep them up with our hands but we failed. Then we did some science. Sam out of our school was a volunteer he had to hold hands with people from other school, but he wouldn’t. After that they needed two more volunteers but no one from our school got picked. The children had to stand inside a giant bubble! Then unfortunately it was time to go. We all went back to school with big smiles on our faces.